Send us a message to get a free week of classes or if you have a general question. We're always here to help. 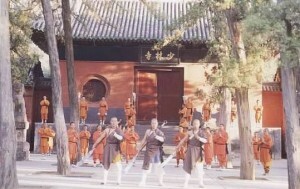 Shaolin Kung Fu emphasizes Chán Buddhism. Chán derives its name from the Indian word “dhyāna”, which simply means "meditation". In China this word became popularly spoken as Chánna in Chinese and was later shorted to Chán. In Japan, the shortening of Zenna to Zen also occurred - though China's adoption of Dhyāna predated Japan's. Dhyāna was an Indian form of Buddhist meditation stressing sitting meditation and other forms of meditation to help bring about enlightenment in its practitioners. Bodhidharma also taught the Chinese monks martial exercises which later become known by such names as Wushu, Hao Lin Chuan, Gong Fu, and "Kung Fu" in the West. These arts spread to Japan and other cultures which made them their own. Kung Fu did not originate completely from scratch within China, as many proud Chinese patriots have enthusiastically claimed, but the martial arts as we know them were for the most part formed, shaped, and cradled by the Shaolin Temple throughout history. In the sense of the Shaolin Temple being a rigorous martial arts college and laboratory for creating, refining, and preserving Chinese martial arts. Given the fact that most Asian martial arts derive from their Chinese predecessors at Shaolin Temple, the saying that "all martial styles were born under the sun of Shaolin" indeed has much truth in it. It might be more accurate to say that most popular martial arts that emerged from Asia had a pre-history and formation period at the Shaolin Temple. Certainly, any Asian martial arts known or practiced today owe a huge debt to Shaolin Kung Fu. The Shaolin Temple for warrior monks is a place where training never ends. Today, the Shaolin Temple is a showpiece of Chinese culture with prestige and tourist value as well. In the past, however, the temple was the protector of the Emperor. As the agents of the Emperor, they were recommended to wear the color yellow, which was reserved for the Emperor's retinue. Today, the Shaolin monks continue to wear the color yellow in their robes out of respect for the original symbolism. TRY US OUT FOR A FREEWEEK OF CLASSES!